Most of our choices are “unconscious.” We have been programmed by what has happened to us in the past and we do not even stop to think about WHY we make the decisions we make. Part of the issue is how I was raised. I am used to being responsible for everything and everyone. I was a precocious first born child who was also a little OCD. When I was a child I decided that it was more honorable to put myself last in everything. But as I matured I recognized that this behavior is not always honorable or wise. So I have to stop and remind myself that the ax needs sharpening; I need to take care of me first. You might or might not be shocked at what happens when I make that decision; people don’t always like it and many times they get angry with me when things change. I then have another decision to make. Will I allow their disapproval of me to cause me so much grief, fear, or whatever emotion their behavior elicits that I succumb to their demands? It was not always easy to stand my ground in the past. I used to give in. Now, at least I think about it and make a conscious decision to not give in. I am in the midst of one of those times right now. I am dealing with someone who has an event coming up. He wants this to be the most perfect event in his life. And he has health issues that he believes have to be totally resolved before this event takes place. He is pushing me to do things I don’t believe is best for him—all in an attempt to make sure everything, including the way he feels, is flawless. And the way he does this is by wearing me down until I give into his demands. I have some hot buttons I have to deal with here. He is a man (my father was authoritarian and demanded complete obedience). He hits my over-responsibility button, and when I get tired, I am more vulnerable. So I must be alert and recognize clearly what is going on. I know from the start that I need to take time and make sure I am making the right decisions here and not acting out of my emotions. And I have to recognize that he might not like what I have to say. He might react in anger. How will I deal with that? I have to be prepared to make a choice at that time. 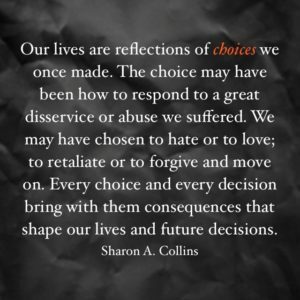 All of our actions are based on choices we make. All of our decisions come with consequences that we will have to deal with down the line. We are not automatons; we are complicated beings who can and should analyze our behaviors and contemplate and identified what is driving them.